Bingo is lotería in Spanish, and it is an excellent language learning activity. Below you’ll find a printable Spanish Bingo game for Valentine’s Day that you can use with a wide range of ages. You can adapt Spanish Bingo, or lotería, to any theme. It is one of the most versatile games for Spanish class! As students play, they practice vocabulary, listening comprehension and reading. If you let them do the calling, it can also be a speaking activity. If you’re looking for more activities with specific vocabulary, check out all our Spanish vocabulary games grouped by theme. The traditional lotería is also a wonderful cultural activity. Learn more about Spanish Bingo including the traditional cards and sentences that callers use. I often have students write the sentences that I am going to use as examples for the words. You can do it in small groups and give each group some of the vocabulary words. It works well, and they love hearing their sentences read as I call the words. Students can create their own cards by writing the words into a grid to random order. 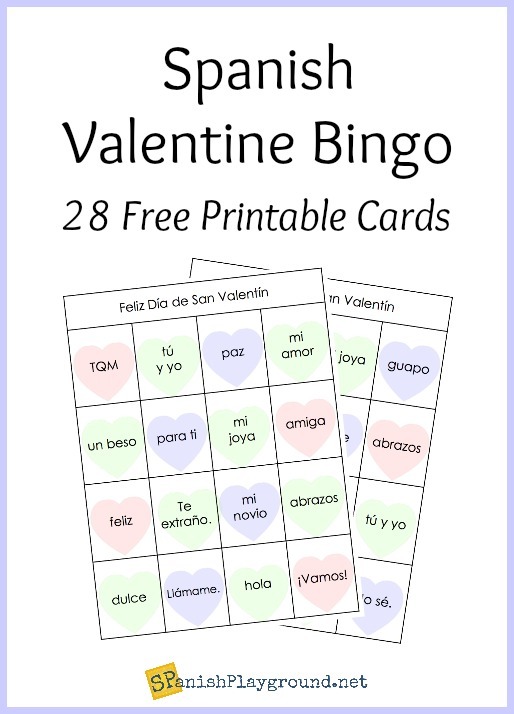 You can also use Spanish bingo generators online, or find games like the free printable Spanish bingo game for Valentine’s Day that I’m sharing below. On Spanish Playground, we have other fun Spanish vocabulary activities for Valentine’s Day. This Spanish syllable counting activity is fun, and so is this Spanish Valentine Game with Rhymes. You might also like this Spanish Valentine Words Poster and Games. 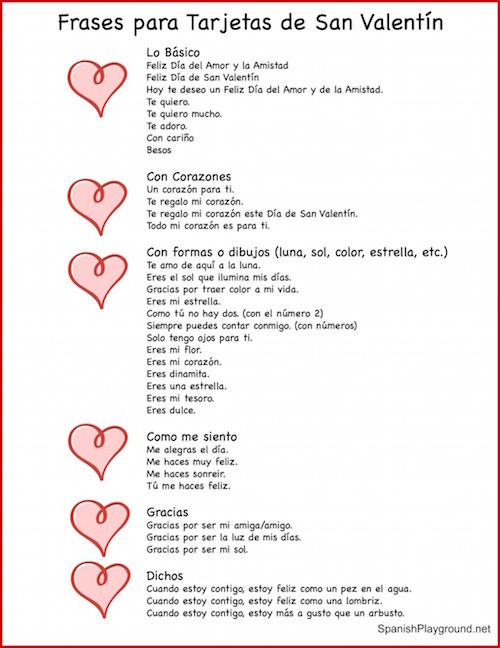 If you are making Valentine’s cards with your class or your kids at home, this printable list of Spanish Valentine Phrases for Cards is a huge help! This Habla Pamela video is also perfect for a Valentine’s Day Spanish lesson. Pamela talks about Valentine’s Day in Spanish using high-frequency vocabulary with lots of visual support. The phrases and words on the cards in this printable Spanish Bingo game are based on the phrases that you find on candy conversation hearts. Many of them are high-frequency vocabulary that students know used in a different context. For example, students are familiar with hola, feliz, llámame, buen día, dulce, guapo, vamos and para ti as everyday vocabulary. 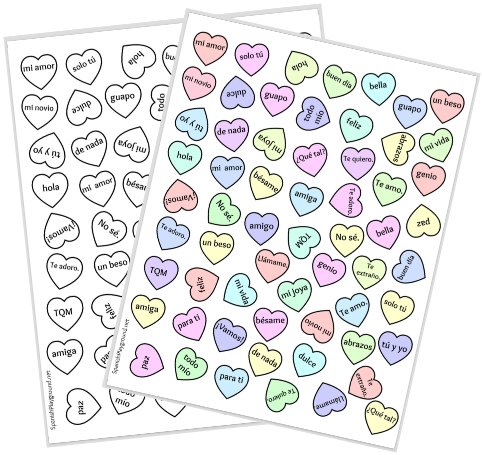 I have a Spanish Candy Hearts Printable Activity that uses the same phrases. Use it in conjunction with the printable Spanish Bingo game below to give students more exposure to these useful words and phrases. Valentine’s Day is one of my favorite holidays to celebrate with language learners, because it is about love and friendship. Also, there is so much built-in language. From cards to candy hearts, it is all about expressing affection. That is perfect for learning language! I hope you make this free printable Spanish Bingo game for Valentine’s Day part of your celebration.